Panzanella served at Canary By Gorji this summer. From Zing! By Gorji Cookbook. 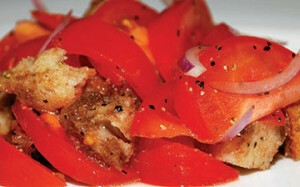 Panzanella recipe from Zing! By Gorji Cookbook—New Mediterranean Cuisine. Try this recipe and let us know how it worked for you. Other media articles about Zing! By Gorji Cookbook. 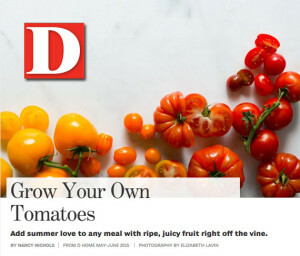 No Replies to "D Home Magazine Features Zing! Cookbook Panzanella Recipe"
We are very small with only 7 tables. We believe dining should be pleasurable and relaxed, so we do not rush you through your dinner to "turn the table" to seat more people, we do not have televisions and unfortunately cannot accommodate young children. We thank you for your understanding of these matters and hope you enjoy your time with us when dining in Dallas. Sign up to be notified of cooking classes, wine pairings, chef's specials, and sauces.